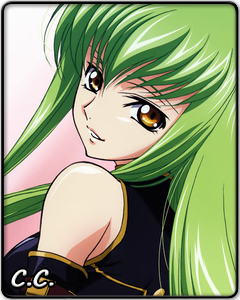 C.C easily attracts the eyes of men with her exquisite, but cold and detached beauty. It seems nothing could break through her indifference. She supports and she betrays, always with the same uncaring expression on her face. She has lived through enough to distance herself from her emotions. But even for someone like her, there is something pushing her forward, a goal she absolutely has to achieve, even if it means making endless sacrifices along the way. Will what C.C strives for let her regain her smile? Or is it something else entirely? That is one of the many secrets she keeps to herself. On rare occasions, C.C's troubled past catches up to her. There are decisions she regrets and people she could not help growing close to... Those are the few cracks in her impenetrable mask. In her moments of vulnerability, C.C reveals a more human side and shows her doubt about the path she has taken. But is there anything that could stop her? Fun, sensual pleasure, bonds, love? Or is there someone who can save her from the darkness ahead?